A heart-wrenching debut novel about a young couple trying to find out what they really want in life–and whether or not that includes each other.Julia and Evan fall in love as undergraduates at Yale. For Evan, who grew up in a small town in Canada, Yale is a whole new world, and Julia–blond, beautiful and rich–is part of his vision for a successful future. 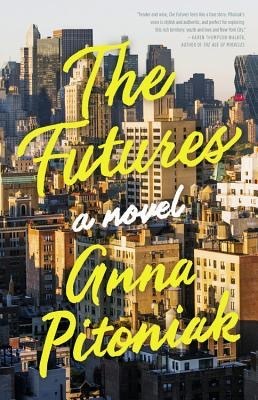 After they graduate in 2008, they move together to New York city, where Evan takes a job at a hedge fund–another step forward in the life he imagines for himself.Julia, who has only known a life of privilege, graduates with an art history degree and no plan for her own future. She lands a low paying assistant job at a nonprofit, unsure about what she really wants, and wondering when everyone else figured that out for themselves. With the market crashing and banks failing around him, Evan becomes involved in an increasingly high-stakes deal at work, and begins to realize that the price of privilege may come with dangerous strings attached. Meanwhile, Julia reconnects with someone from her past–someone who offers her a vision of a different kind of life.Told in alternating perspectives, The Futures is a vivid story about love–falling in and out of it–betrayal, and the burning desire to be valued. Told from both Julia and Evan’s point of view, The Futures is a tale of that awkward period in ones life immediately after college where the transition from the carefree days of school to work begins. Both Julia and Evan struggle to adapt to adulthood in different ways and there is an underlying sense of uneasiness and dread throughout as you know something is going to happen to throw them off course. I liked the setting of NYC in 2008 during the Great Recession as I remember those days clearly. Evan seems to have found his spot in the city when he lands a highly sought after job at a hedge fund. Julia however struggles to find her place and a wedge is quickly driven between the couple. Resentment and hostilities surface and betrayals are committed against each other. Both of them make the typical mistakes that the young and naive so often do and both are also pretty self absorbed and privileged but they’re still oddly likable and endearing. Pitoniak has a strong writing style with a very polished feel that was brought to life by the fantastic narrators. Both did an excellent job at portraying their characters and conveyed the emotional and evocative feel beautifully. The ending was open ended which isn’t my favorite thing, but it did work well here. I remember those days as well, and having a book set back then would make for interesting reading/listening. I’m planning on a very long car trip this summer, and I think this might be a good book to listen to on the way. Oh, open endings, they’re so difficult… I like them sometimes, for thrillers surely not, but for this kind of books I guess it depends!